Diagnosed with breast cancer in September 2018, Pat’s finding the focus of her dual MoonWalk and #walk1000miles challenges a real help. Since my first MoonWalk in 2011, I have spent the following years raising funds and walking many miles for breast cancer charity Walk the Walk – I have walked numerous MoonWalks (overnight marathons, wearing a decorated bra!) and also raised money for Walk the Walk at a number of marathon walking events in various countries. My favourite was the Nijmegen Marches in the Netherlands…100 miles over 4 days. I decided to sign up to the 1,000 mile challenge in an attempt to get me fit enough to walk parts of the Great Wall of China in October 2019, again to raise money for Walk the Walk. I booked the trip a year ago…but a major curveball was thrown my way in September 2018 that reduced my walking distances significantly. In September 2018 I was diagnosed with breast cancer – I consider myself to be one of the “lucky ones” (if such a person exists) I discovered a lump and had it diagnosed quickly. A lumpectomy quickly followed in October and by November I had seen the oncologist - it was decided a course of 15 radiotherapy treatments were required along with 5 years of hormone therapy tablets – all to keep the cancer from returning. However due to the timing of Christmas I had to wait until 2nd January for treatment to begin. 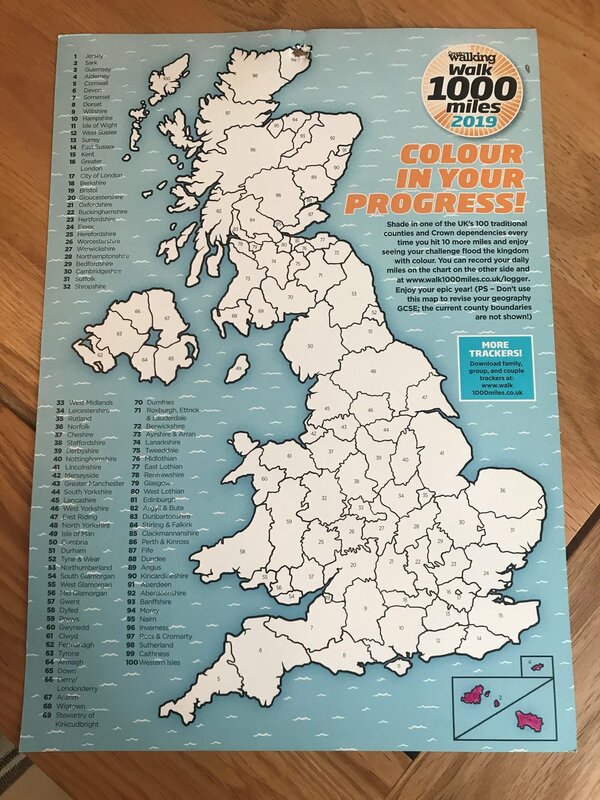 I signed up for the 1,000 mile Challenge on 29th December – I needed to focus on a long term goal during 2019. I decided that my mileage would include all dog walks; training and event mileage. I finished treatment on 22nd January…in those 3 weeks I tried to walk as much as possible. Given I was signed off from work, if I needed anything from the shops, I made a point of walking rather than jumping in the car; on a few days when I felt up to it I went for a walk around the estate…it may have only been 1 or 2 miles each time, which doesn’t feel far to me, but it would all add up. During all of this I needed to decide if I was still going to try to go to China…the answer was an overwhelming YES…I needed something to focus on. Needless to say, other walking events have now appeared in my diary…the Big Half (March), The MoonWalk (May) and Nijmegen Marches (July), all raising money for Walk the Walk …the training for all of these & the actual events will lead up to my trip to China to walk parts of the Great Wall. Well, it has been a slow, but expected start to the year & I have managed to walk 43 miles so far…I have planned ahead & I know roughly how many miles I need to walk each month to make sure I can achieve the 1,000 miles. A lot of colouring still required… but it’s a start. WIN - 1 of 3 new Deuter trail backpacks!